What is the fastest way to calculate the record COUNT? I have always liked simple questions with lots of pitfalls. Here is the one: how do you count the total number of records in a table? At first sight, it’s a snap, but if you dig a little deeper, you can reveal lots of peculiar nuances. So, let’s start from a simple thing. Do the following queries differ in terms of the end result? Most of you will say there is no difference. The given queries will return the identical result, but COUNT will return the value of the INT type, while COUNT_BIG will return the value of the BIGINT type. If we analyze the execution plan, we will notice the differences, that are often overlooked. When using COUNT, the plan will show the Compute Scalar operation. It happens because COUNT_BIG is used implicitly when calling COUNT, and then the result is converted into INT. Remember that data type conversion increases the processor load. Many of you may say that this operator is not a big deal in terms of execution. However, there is a thing worth mentioning – SQL Server tends to underestimate the Compute Scalar operators. Nevertheless, the aforesaid example does not require worrying about performance – the truncation of Int64 to Int32 does not require much resources. Now, let’s dwell on performance issues. If we use the aforesaid queries, we should use Full Index Scan (or Full Table Scan if it is a heap table) for counting SQL Server records. Anyways, these operations are far from being fast. The best way to get the record count is to use the sys.dm_db_partition_stats or sys.partitions system views (there is also sysindexes, but it has been left for the backward compatibility with SQL Server 2000). Table 'SalesOrderDetail'. 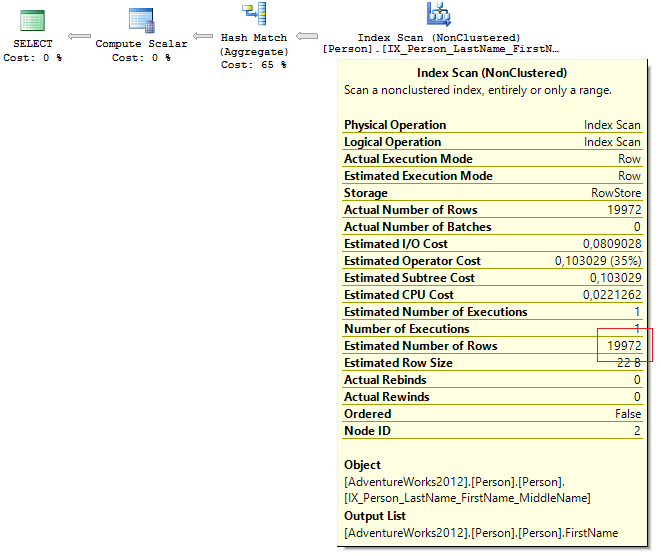 Scan count 1, logical reads 276, ... SQL Server Execution Times: CPU time = 12 ms, elapsed time = 26 ms. Table 'sysrowsets'. 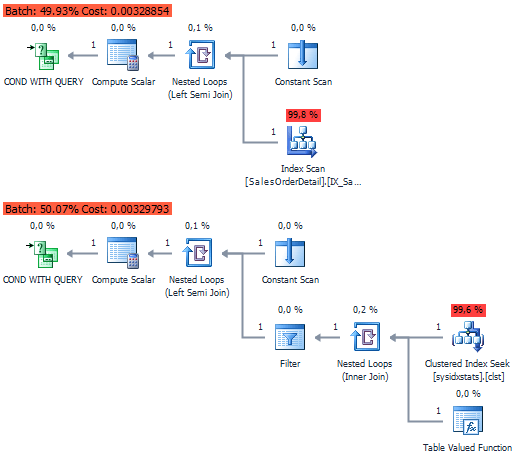 Scan count 1, logical reads 5, ... SQL Server Execution Times: CPU time = 4 ms, elapsed time = 4 ms. Table 'sysidxstats'. Scan count 1, logical reads 2, ... SQL Server Execution Times: CPU time = 2 ms, elapsed time = 1 ms.
CPU time = 12 ms, elapsed time = 26 ms.
CPU time = 4 ms, elapsed time = 4 ms.
CPU time = 2 ms, elapsed time = 1 ms.
Table 'big_test'. Scan count 6, logical reads 114911, ... SQL Server Execution Times: CPU time = 4859 ms, elapsed time = 5079 ms. Table 'sysrowsets'. 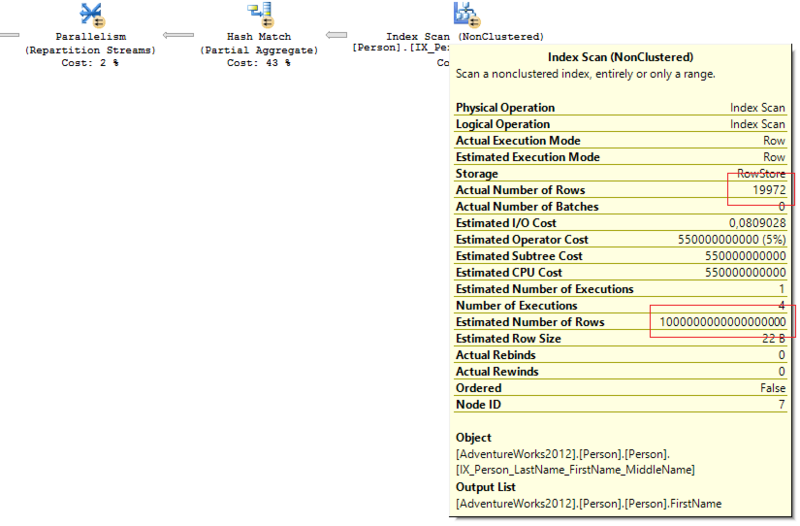 Scan count 1, logical reads 25, ... SQL Server Execution Times: CPU time = 0 ms, elapsed time = 2 ms. Table 'sysidxstats'. Scan count 1, logical reads 2, ... SQL Server Execution Times: CPU time = 0 ms, elapsed time = 2 ms.
CPU time = 4859 ms, elapsed time = 5079 ms. In case you need to check the records availability in a table, the usage of metadata does not deliver any particular advantages (as it has been showed above). Table 'SalesOrderDetail'. 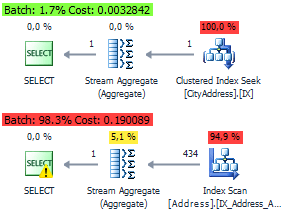 Scan count 1, logical reads 2,... SQL Server Execution Times: CPU time = 1 ms, elapsed time = 3 ms. Table 'sysidxstats'. Scan count 1, logical reads 2,... SQL Server Execution Times: CPU time = 4 ms, elapsed time = 5 ms.
CPU time = 1 ms, elapsed time = 3 ms.
CPU time = 4 ms, elapsed time = 5 ms. In practical terms, it will be a bit slower, since SQL Server generates more complicated execution plan for selection from metadata. With optimizer, this case can be simplified to the plan we got in EXISTS. It gets more interesting, when we need to count the number of records for all tables at once. In my practice, I encountered several variants. In spite of all praises I heaped upon system views, there are still some unexpected “pleasures” you may experience when working with them. I remember an amusing bug – system views were being updated incorrectly during migration from SQL Server 2000 to 2005. The most “lucky” ones were receiving incorrect values of row count in tables from metadata. The restatement was DBCC UPDATEUSAGE. The query did not contain predicates for filtering, and the optimizer chose Full Index Scan. During Full Index/Table Scan, the optimizer takes the expected number of rows from metadata instead of statistics (I’m not quite sure whether it always happens). It’s no secret that SQL Server generates execution plan on the basis of Estimated number of rows and counts the memory required for its execution. The incorrect evaluation may lead to occupation of excessive memory. As a matter of fact, we need to execute the query under the SERIALIZABLE isolation level to get the correct number of records in the table. Alternatively, we can use the TABLOCKX hint. In result, we get the exclusive lock of the table for the time of query execution. What is better? The answer is – decide for yourself. My choice is metadata. In this post, I wanted to show that there are no ideal solutions for every day of your life. You should act as the occasion requires in every particular case. All tests have been performed on SQL Server 2012 SP3 (11.00.6020). 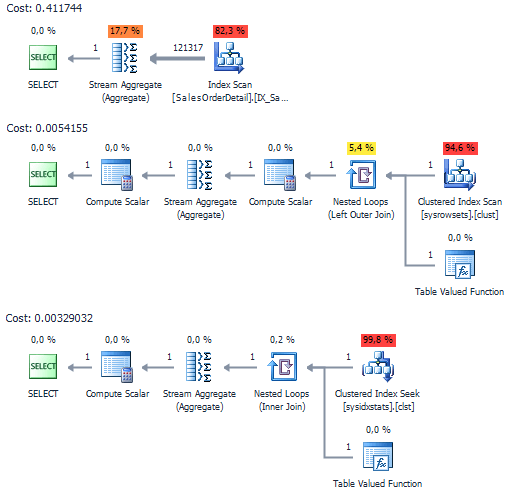 Execution plans have been taken from SSMS 2014 and dbForge Studio for SQL Server. When I need to count the number of table rows, I use metadata – it is the fastest way. Do not be afraid of the old bug case I described. If there is a need to quickly count the number of rows from a perspective of some field or by condition, I try using indexed views or filtered indexes. It all depends upon the situation. When a table is small or when productivity issue is not put at stake, the old-school SELECT COUNT(*)… will be the best option. Nice information. Thanks a lot for explaining.